Five pro-democracy lawmakers were kicked out of the legislative chamber on Wednesday following protests during the final debate on the controversial joint checkpoint bill for the upcoming high-speed rail project. The pro-democracy camp has called for a rally on Thursday night as the bill is set to pass this week. 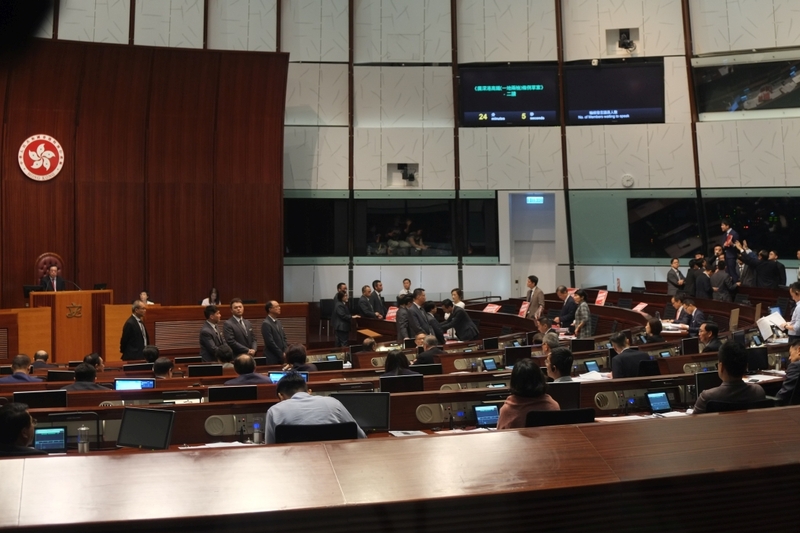 On Wednesday, democrats were protesting against the Legislative Council president’s decision last week whereby 11 lawmakers would not be allowed to speak during the bill’s second reading debate. 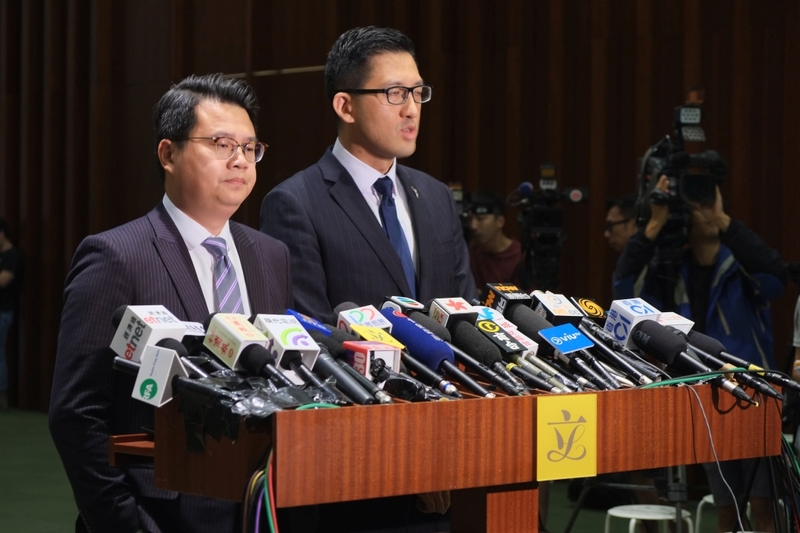 The pro-democracy camp, as well as the Hong Kong Bar Association, have deemed the bill unconstitutional as Hong Kong is set to effectively give up its jurisdiction across a quarter of the West Kowloon terminus, where immigration and customs procedures will be performed by mainland law enforcement agents. Roy Kwong standing on his desk in protest against Andrew Leung. Photo: Kris Cheng/HKFP. 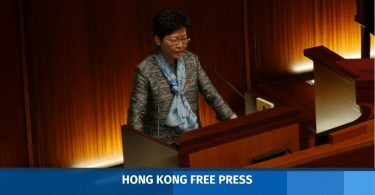 On Wednesday, Leung asked Secretary for Transport and Housing Frank Chan to make his concluding speech for the second reading, stripping lawmakers of their opportunities to speak for 15 minutes each. Several lawmakers of the pro-democracy camp stood up in protest and demanded Leung address their procedural questions. Lam Cheuk-ting being removed. Photo: Screenshot/inmediahk.net. 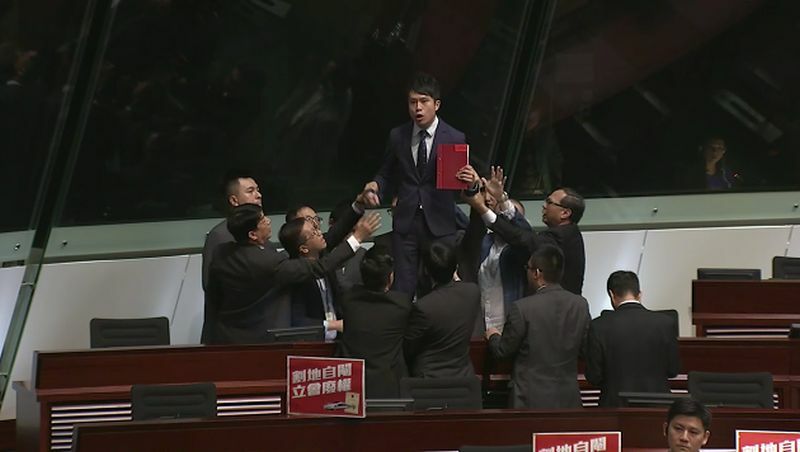 Leung ordered Democratic Party lawmaker Lam Cheuk-ting to leave as he was shouting in protest. The party’s Andrew Wan was also kicked out for attempting to protect Lam from being removed by security guards. During the protests, Frank Chan held his microphone close to his mouth in order to continue his speech. Au Nok-hin protesting behind Frank Chan. Photo: Screenshot/inmediahk.net. Lam said Leung was turning the legislature into a rubber stamp to pass controversial laws in haste. Lam said the bill will very likely be passed with the support of the pro-Beijing camp. “They don’t even have the confidence to listen to opposition opinion – it will not block the rail from operating [in September] at all,” he said. He also said five guards used unnecessary force to remove him as he only adopted “passive resistance,” whereby he sat in his seat and did not use violence against the guards. Wan said that the guards grabbed his arms and body to remove him whilst he was sitting at his seat and the president did not order him to leave. 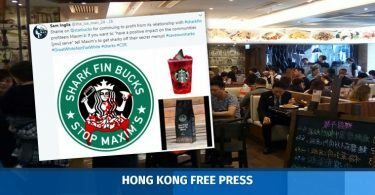 Wan warned that such measures by guards could be deployed during controversial legislative debates in the future, such as the national anthem law and the national security law. Democratic Party lawmakers Ted Hui and Roy Kwong were also removed. Kwong stood on his desk in protest and was ordered to leave. 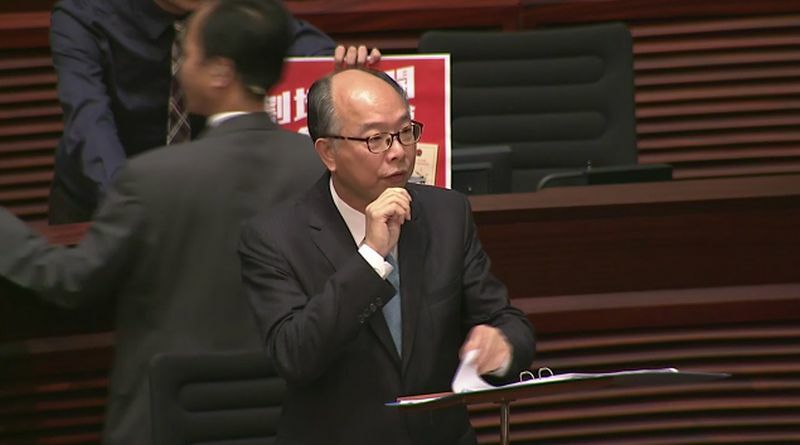 Lawmaker Au Nok-hin was removed as he was standing behind Secretary Frank Chan with a protest placard. 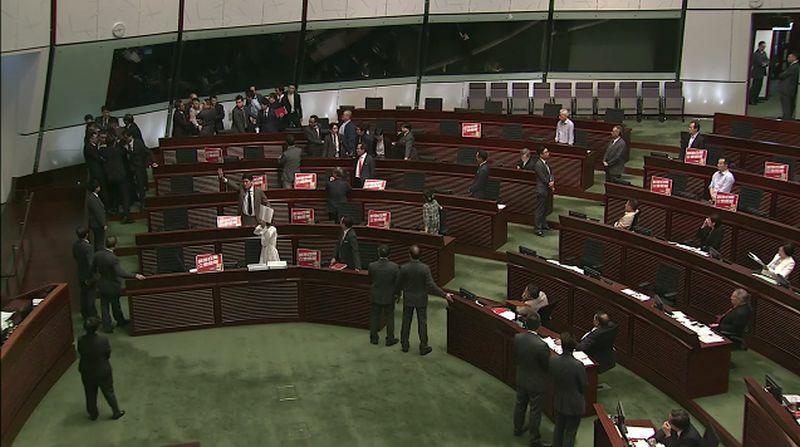 The second reading passed with 41 “yes” votes from the pro-Beijing camp and 20 “no” votes from the democrats. Roy Kwong and Au Nok-hin. Photo: Kris Cheng/HKFP. During the vote, Democratic Party lawmaker James To said security guards should not be blocking pathways between lawmakers and the president, without an order from Leung. “Is martial law in place now? Why are they standing there?” he said. The guards then returned to their posts. After passing the second reading, the legislature moved to debate amendments ahead of the third reading. 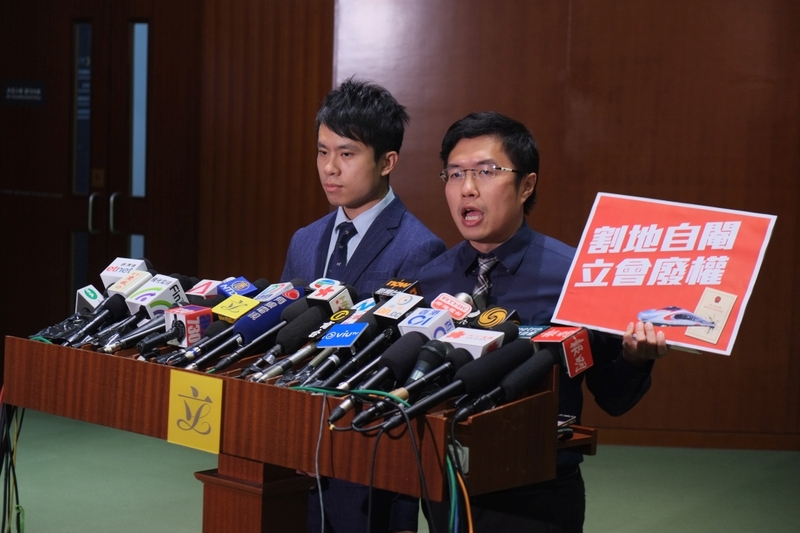 President Andrew Leung has said lawmakers may only spend around 30 hours on the debates.